The first complete and annotated English translation of Maimon’s influential and delightfully entertaining memoir. 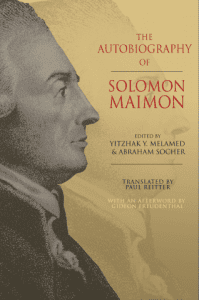 Solomon Maimon’s autobiography has delighted readers for more than two hundred years, from Goethe, Schiller, and George Eliot to Walter Benjamin and Hannah Arendt. The American poet and critic Adam Kirsch has named it one of the most crucial Jewish books of modern times. Here is the first complete and annotated English edition of this enduring and lively work. Born into a down-on-its-luck provincial Jewish family in 1753, Maimon quickly distinguished himself as a prodigy in learning. Even as a young child, he chafed at the constraints of his Talmudic education and rabbinical training. He recounts how he sought stimulation in the Hasidic community and among students of the Kabbalah–and offers rare and often wickedly funny accounts of both. After a series of picaresque misadventures, Maimon reached Berlin, where he became part of the city’s famed Jewish Enlightenment and achieved the philosophical education he so desperately wanted, winning acclaim for being the “sharpest” of Kant’s critics, as Kant himself described him. This new edition restores text cut from the abridged 1888 translation by J. Clark Murray, which has long been the only available English edition. Paul Reitter’s translation is brilliantly sensitive to the subtleties of Maimon’s prose while providing a fluid rendering that contemporary readers will enjoy, and is accompanied by an introduction and notes by Yitzhak Melamed and Abraham Socher that give invaluable insights into Maimon and his extraordinary life. The book also features an afterword by Gideon Freudenthal that provides an authoritative overview of Maimon’s contribution to modern philosophy. Yitzhak Y. Melamed is the Charlotte Bloomberg Professor of Philosophy at Johns Hopkins University. Abraham Socher is associate professor of Jewish studies and religion at Oberlin College. Paul Reitter is professor of Germanic languages and literatures at Ohio State University. Gideon Freudenthal is professor emeritus at Tel Aviv University’s Cohn Institute for the History and Philosophy of Science and Ideas. 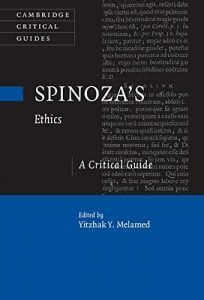 Spinoza’s Ethics, published in 1677, is considered his greatest work and one of history’s most influential philosophical treatises. This volume brings established scholars together with new voices to engage with the complex system of philosophy proposed by Spinoza in his masterpiece. Topics including identity, thought, free will, metaphysics, and reason are all addressed, as individual chapters investigate the key themes of the Ethics and combine to offer readers a fresh and thought-provoking view of the work as a whole. Written in a clear and accessible style, the volume sets out cutting-edge research that reflects, challenges, and promotes the most recent scholarly advances in the field of Spinoza studies, tackling old issues and bringing to light new subjects for debate. Eternity is a unique kind of existence that is supposed to belong to the most real being or beings. It is an existence that is not shaken by the common wear and tear of time. 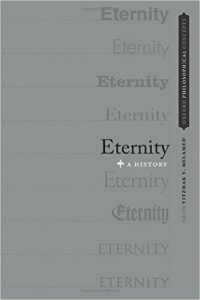 Over the two and half millennia history of Western philosophy we find various conceptions of eternity, yet one sharp distinction between two notions of eternity seems to run throughout this long history: eternity as timeless existence, as opposed to eternity as existence in all times. Both kinds of existence stand in sharp contrast to the coming in and out of existence of ordinary beings, like hippos, humans, and toothbrushes: were these eternally-timeless, for example, a hippo could not eat, a human could not think or laugh, and a toothbrush would be of no use. Were a hippo an eternal-everlasting creature, it would not have to bother itself with nutrition in order to extend its existence. Everlasting human beings might appear similar to us, but their mental life and patterns of behavior would most likely be very different from ours. Ex nihilo nihil fit. Philosophy, especially great philosophy, does not appear out of the blue. In the current volume, a team of top scholars-both up-and-coming and established-attempts to trace the philosophical development of one of the greatest philosophers of all time. Featuring twenty new essays and an introduction, it is the first attempt of its kind in English and its appearance coincides with the recent surge of interest in Spinoza in Anglo-American philosophy. There can be little doubt that without Spinoza, German Idealism would have been just as impossible as it would have been without Kant. Yet the precise nature of Spinoza’s influence on the German Idealists has hardly been studied in detail. This volume of essays by leading scholars sheds light on how the appropriation of Spinoza by Fichte, Schelling and Hegel grew out of the reception of his philosophy by, among others, Lessing, Mendelssohn, Jacobi, Herder, Goethe, Schleiermacher, Maimon and, of course, Kant. The volume thus not only illuminates the history of Spinoza’s thought, but also initiates a genuine philosophical dialogue between the ideas of Spinoza and those of the German Idealists. The issues at stake – the value of humanity; the possibility and importance of self-negation; the nature and value of reason and imagination; human freedom; teleology; intuitive knowledge; the nature of God – remain of the highest philosophical importance today. 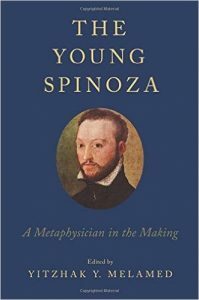 Yitzhak Melamed here offers a new and systematic interpretation of the core of Spinoza’s metaphysics. In the first part of the book, he proposes a new reading of the metaphysics of substance in Spinoza: he argues that for Spinoza modes both inhere in and are predicated of God. Using extensive textual evidence, he shows that Spinoza considered modes to be God’s propria. He goes on to clarify Spinoza’s understanding of infinity, mereological relations, infinite modes, and the flow of finite things from God’s essence. In the second part of the book, Melamed relies on this interpretation of the substance-mode relation and the nature of infinite modes and puts forward two interrelated theses about the structure of the attribute of Thought and its overarching role in Spinoza’s metaphysics. First, he shows that Spinoza had not one, but two independent doctrines of parallelism. Then, in his final main thesis, Melamed argues that, for Spinoza, ideas have a multifaceted (in fact, infinitely faceted) structure that allows one and the same idea to represent the infinitely many modes which are parallel to it in the infinitely many attributes. Thought turns out to be coextensive with the whole of nature. Spinoza cannot embrace an idealist reduction of Extension to Thought because of his commitment to the conceptual separation of the attributes. Yet, within Spinoza’s metaphysics, Thought clearly has primacy over the other attributes insofar as it is the only attribute which is as elaborate, as complex, and, in some senses, as powerful as God. What is meant by scientific evidence, and how can a definition of this concept be applied in the sciences to determine whether observed facts constitute evidence that a given theory is true? 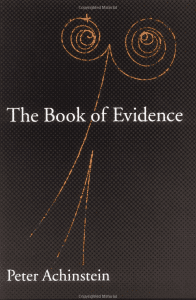 In this book, Peter Achinstein proposes and defends several objective concepts of evidence. He then explores the question of whether a scientific method, such as that represented in the four “Rules for the Study of Natural Philosophy” that Isaac Newton invoked in proving his law of gravity, can be employed in demonstrating how the proposed definitions of evidence are to be applied to real scientific cases. In answering this question, he offers a new interpretation of Newton’s controversial rules. Contrary to what many methodologists assume, whether the rules, so interpreted, can be used to determine whether observed phenomena provide evidence for a theory is an empirical question, not an a priori one. Finally, in order to deal with numerous cases in which evidence is insufficient to establish a theory, or where no theory is even available, Achinstein describes and defends three scientific methods proposed by the 19th century theoretical physicist James Clerk Maxwell, in the course of developing his electrical and molecular theories. 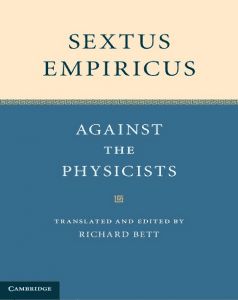 Sextus Empiricus’ Against the Physicists examines numerous topics central to ancient Greek inquiries into the nature of the physical world, covering subjects such as god, cause and effect, whole and part, bodies, place, motion, time, number, coming into being and perishing and is the most extensive surviving treatment of these topics by an ancient Greek sceptic. 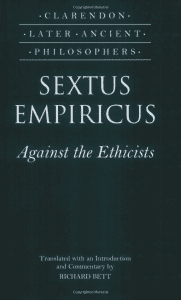 Sextus scrutinizes the theories of non-sceptical thinkers, and generates suspension of judgement through the assembly of equally powerful opposing arguments. 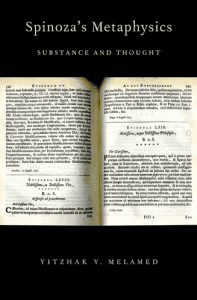 Richard Bett’s edition provides crucial background information about the text and elucidation of difficult passages. 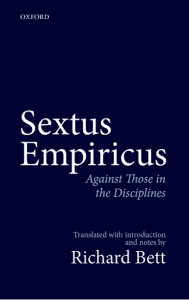 His accurate and readable translation is supported by substantial interpretative aids, including a glossary and a list of parallel passages relating Against the Physicists to other works by Sextus. This is an indispensable edition for advanced students and scholars studying this important work by an influential philosopher. Kant declared that philosophy began in 1781 with his Critique of Pure Reason. In 1806 Hegel announced that philosophy had now been completed. Eckart Förster examines the reasons behind these claims and assesses the steps that led in such a short time from Kant’s “beginning” to Hegel’s “end.” He concludes that, in an unexpected yet significant sense, both Kant and Hegel were indeed right. The Twenty-Five Years of Philosophy follows the unfolding of a key idea during this exceptionally productive period: the Kantian idea that philosophy can be scientific and, consequently, can be completed. Förster’s study combines historical research with philosophical insight and leads him to propose a new thesis. The development of Kant’s transcendental philosophy in his three Critiques, Förster claims, resulted in a fundamental distinction between “intellectual intuition” and “intuitive understanding.” Overlooked until now, this distinction yields two takes on how to pursue philosophy as science after Kant. One line of thought culminates in Fichte’s theory of freedom (Wissenschaftslehre), while the other—and here Förster brings Goethe’s significance to the fore—results in Goethe’s transformation of the Kantian idea of an intuitive understanding in light of Spinoza’s third kind of knowledge. Both strands are brought together in Hegel and propel his split from Schelling. Förster’s work makes an original contribution to our understanding of the classical era of German philosophy—an expanding interest within the Anglophone philosophical community. This book provides a new interpretation of the ethical theory of G.W.F. Hegel. The aim is not only to give a new interpretation for specialists in German Idealism, but also to provide an analysis that makes Hegel’s ethics accessible for all scholars working in ethical and political philosophy. While Hegel’s political philosophy has received a good deal of attention in the literature, the core of his ethics has eluded careful exposition, in large part because it is contained in his claims about conscience. This book shows that, contrary to accepted wisdom, conscience is the central concept for understanding Hegel’s view of practical reason and therefore for understanding his ethics as a whole. 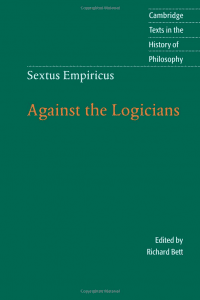 The argument combines careful exegesis of key passages in Hegel’s texts with detailed treatments of problems in contemporary ethics and reconstructions of Hegel’s answers to those problems. 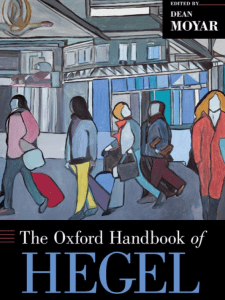 The main goals are to render comprehensible Hegel’s notoriously difficult texts by framing arguments with debates in contemporary ethics, and to show that Hegel still has much to teach us about the issues that matter to us most. Central topics covered in the book are the connection of self-consciousness and agency, the relation of motivating and justifying reasons, moral deliberation and the holism of moral reasoning, mutual recognition, and the rationality of social institutions. 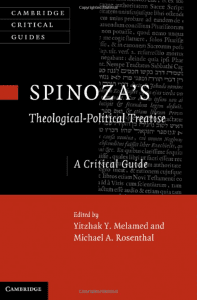 Spinoza’s Theological-Political Treatise was published anonymously in 1670 and immediately provoked huge debate. Its main goal was to claim that the freedom of philosophizing can be allowed in a free republic and that it cannot be abolished without also destroying the peace and piety of that republic. Spinoza criticizes the traditional claims of revelation and offers a social contract theory in which he praises democracy as the most natural form of government. This new Critical Guide presents new essays by well-known scholars in the field and covers a broad range of topics, including the political theory and the metaphysics of the work, religious toleration, the reception of the text by other early modern philosophers, and the relation of the text to Jewish thought. It offers valuable new perspectives on this important and influential work. The essays in this volume address three fundamental questions in the philosophy of science: What is required for some fact to be evidence for a scientific hypothesis? What does it mean to say that a scientist or a theory explains a phenomenon? Should scientific theories that postulate “unobservable” entities such as electrons be construed realistically as aiming to correctly describe a world underlying what is directly observable, or should such theories be understood as aiming to correctly describe only the observable world? 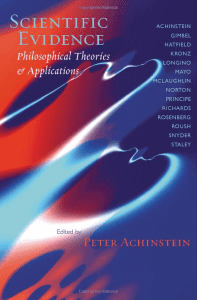 Distinguished philosopher of science Peter Achinstein provides answers to each of these questions in essays written over a period of more than 40 years. The present volume brings together his important previously published essays, allowing the reader to confront some of the most basic and challenging issues in the philosophy of science, and to consider Achinstein’s many influential contributions to the solution of these issues. He presents a theory of evidence that relates this concept to probability and explanation; a theory of explanation that relates this concept to an explaining act as well as to the different ways in which explanations are to be evaluated; and an empirical defense of scientific realism that invokes both the concept of evidence and that of explanation. The 19th century is a period of stunning philosophical originality, characterized by radical engagement with the emerging human sciences. Often overshadowed by 20th-century philosophy, which sought to reject some of its central tenets, the philosophers of the 19th century have re-emerged as profoundly important figures. new directions in Mind and Logic, including Brentano, Frege and Husserl. The Routledge Companion to Nineteenth Century Philosophy is essential reading for students of philosophy, and for anyone interested in this period in related disciplines such as politics, history, literature and religion. Physicists think they have discovered the top quark. Biologists believe in evolution. But what precisely constitutes evidence for such claims, and why? Scientists often disagree with one another over whether or to what extent some evidence counts in favor of a theory because they are operating with different concepts of scientific evidence. These concepts need to be critically explored. Peter Achinstein has gathered some prominent philosophers and historians of science for critical and lively discussions of both general questions about the meaning of evidence and specific ones about evidence for particular scientific theories. Contributors: Peter Achinstein, The Johns Hopkins University; Steven Gimbel, Gettysburg College; Gary Hatfield, University of Pennsylvania; Frederick M. Kronz, University of Texas–Austin; Helen Longino, University of Minnesota; Deborah G. Mayo, Virginia Tech; Amy L. McLaughlin, Florida Atlantic University; John Norton, University of Pittsburgh; Lawrence M. Principe, The Johns Hopkins University; Richard Richards, University of Alabama; Alex Rosenberg, Duke University; Sherrilyn Roush, Rice University; Laura J. Snyder, St. Johns University; Kent Staley, St. Louis University. Is there a universal set of rules for discovering and testing scientific hypotheses? Since the birth of modern science, philosophers, scientists, and other thinkers have wrestled with this fundamental question of scientific practice. Efforts to devise rigorous methods for obtaining scientific knowledge include the twenty-one rules Descartes proposed in his Rules for the Direction of the Mind and the four rules of reasoning that begin the third book of Newton’s Principia, and continue today in debates over the very possibility of such rules. Bringing together key primary sources spanning almost four centuries, Science Rules introduces readers to scientific methods that have played a prominent role in the history of scientific practice. 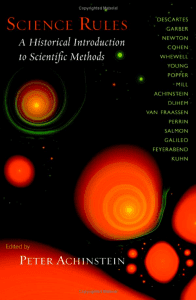 Editor Peter Achinstein includes works by scientists and philosophers of science to offer a new perspective on the nature of scientific reasoning. For each of the methods discussed, he presents the original formulation of the method; selections written by a proponent of the method together with an application to a particular scientific example; and a critical analysis of the method that draws on historical and contemporary sources. 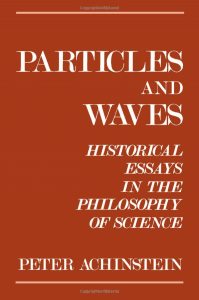 The methods included in this volume are Cartesian rationalism with an application to Descartes’ laws of motion; Newton’s inductivism and the law of gravity; two versions of hypothetico-deductivism—those of William Whewell and Karl Popper—and the nineteenth-century wave theory of light; Paul Feyerabend’s principle of proliferation and Thomas Kuhn’s views on scientific values, both of which deny that there are universal rules of method, with an application to Galileo’s tower argument. Included also is a famous nineteenth-century debate about scientific reasoning between the hypothetico-deductivist William Whewell and the inductivist John Stuart Mill; and an account of the realism-antirealism dispute about unobservables in science, with a consideration of Perrin’s argument for the existence of molecules in the early twentieth century. What is required for something to be evidence for a hypothesis? In this fascinating, elegantly written work, distinguished philosopher of science Peter Achinstein explores this question, rejecting typical philosophical and statistical theories of evidence. He claims these theories are much too weak to give scientists what they want—a good reason to believe—and, in some cases, they furnish concepts that mistakenly make all evidential claims a priori. Achinstein introduces four concepts of evidence, defines three of them by reference to “potential” evidence, and characterizes the latter using a novel epistemic interpretation of probability. The resulting theory is then applied to philosophical and historical issues. Solutions are provided to the “grue,” “ravens,” “lottery,” and “old-evidence” paradoxes, and to a series of questions. These include whether explanations or predictions furnish more evidential weight, whether individual hypotheses or entire theoretical systems can receive evidential support, what counts as a scientific discovery, and what sort of evidence is required for it. The historical questions include whether Jean Perrin had non-circular evidence for the existence of molecules, what type of evidence J. J. Thomson offered for the existence of the electron, and whether, as is usually supposed, he really discovered the electron. Achinstein proposes answers in terms of the concepts of evidence introduced. As the premier book in the fabulous new series Oxford Studies in Philosophy of Science, this volume is essential for philosophers of science and historians of science, as well as for statisticians, scientists with philosophical interests, and anyone curious about scientific reasoning. This is the first book in English devoted entirely to Kant’s Opus postumum and its place in the Kantian oeuvre. Over the last few decades, the importance of this text for our understanding of Kant’s philosophy has emerged with increasing clarity. Although Kant began it in order to solve a relatively minor problem within his philosophy, his reflections soon forced him to readdress virtually all the key problems of his critical philosophy: the objective validity of the categories, the dynamical theory of matter, the natures of space and time, the refutation of idealism, the theory of the self and its agency, the question of living organisms, the doctrine of the practical postulates and the idea of God, the unity of theoretical and practical reason, and the idea of transcendental philosophy itself. In the end Kant was convinced that these problems, some of which had preoccupied him throughout his career, could finally be brought to a coherent and adequate solution and integrated into a single philosophical conception. As Eckart Förster shows in his penetrating study, Kant’s conviction deserves not only our intellectual respect but also our undivided philosophical attention. 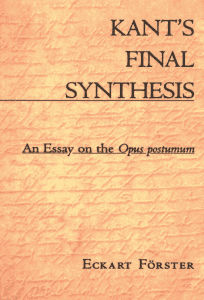 Förster provides detailed analyses of the key problems of Kant’s Opus postumum and also relates them to Kant’s major published writings. In this way he provides unique insights into the extraordinary continuity and inner dynamics of Kant’s transcendental philosophy as it progresses toward its final synthesis. What is epistemology or “the theory of knowledge?” What is it really about? Why does it matter? What makes theorizing about knowledge “philosophical?” Why do some philosophers argue that epistemology—perhaps even philosophy itself—is dead? In this succinct, exciting, and original introduction to epistemology, Michael Williams explains and criticizes philosophical theories of the nature, limits, methods, possibility, and value of knowing. A coherent and progressive text, Problems of Knowledge covers both traditional and contemporary approaches to the subject, including foundationalism, the coherence theory, and “naturalistic” theories. As an alternative to these perspectives, Williams defends his own distinctive contextualist approach. 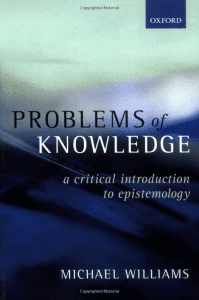 Problems of Knowledge provides clear and engaging explanations of the theory of knowledge and why it matters, offering an excellent foundation for students in introductory epistemology courses. Inspired by the work of Wilfrid Sellars, Michael Williams launches an all-out attack on what he calls “phenomenalism,” the idea that our knowledge of the world rests on a perceptual or experiential foundation. The point of this wider-than-normal usage of the term “phenomenalism,” according to which even some forms of direct realism deserve to be called phenomenalistic, is to call attention to important continuities of thought between theories often thought to be competitors. Williams’s target is not phenomenalism in its classical sense-datum and reductionist form but empiricism generally. Williams examines and rejects the idea that, unless our beliefs are answerable to a “given” element in experience, objective knowledge will be impossible. Groundless Belief was first published in 1977. This second edition contains a new afterword in which Williams places his arguments in the context of some current discussions of coherentism versus the Myth of the Given and explains their relation to subsequent developments in his own epistemological views. Can we reconcile the idea that we are free and responsible agents with the idea that what we do is determined according to natural laws? For centuries, philosophers have tried in different ways to show that we can. Hilary Bok takes a fresh approach here, as she seeks to show that the two ideas are compatible by drawing on the distinction between practical and theoretical reasoning. Bok argues that when we engage in practical reasoning—the kind that involves asking “what should I do?” and sifting through alternatives to find the most justifiable course of action—we have reason to hold ourselves responsible for what we do. But when we engage in theoretical reasoning–searching for causal explanations of events—we have no reason to apply concepts like freedom and responsibility. Bok contends that libertarians’ arguments against “compatibilist” justifications of moral responsibility fail because they describe human actions only from the standpoint of theoretical reasoning. 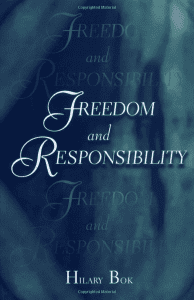 To establish this claim, she examines which conceptions of freedom of the will and moral responsibility are relevant to practical reasoning and shows that these conceptions are not vulnerable to many objections that libertarians have directed against compatibilists. 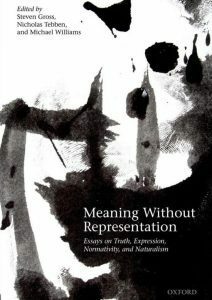 Bok concludes that the truth or falsity of the claim that we are free and responsible agents in the sense those conceptions spell out is ultimately independent of deterministic accounts of the causes of human actions. Clearly written and powerfully argued, Freedom and Responsibility is a major addition to current debate about some of philosophy’s oldest and deepest questions. In Unnatural Doubts, Michael Williams constructs a masterly polemic against the very idea of epistemology, as traditionally conceived. Although philosophers have often found problems in efforts to study the nature and limits of human knowledge, Williams provides the first book that systematically argues against there being such a thing as knowledge of the external world. He maintains that knowledge of the world constitutes a theoretically coherent kind of knowledge, whose possibility needs to be defended, only given a deeply problematic doctrine he calls “epistemological realism.” The only alternative to epistemological realism is a thoroughgoing contextualism.